A mother cries out "You want me to be a refugee in my own country?" You'd think that BEASTS OF NO NATION was a foreign drama made by a foreign director. You'd also think that it's based on a hellish biography or autobiographical accounts. A powerful film set in West African, we see how war and poverty rob a boy of his family, his childhood and his innocence. He's kidnapped into an army of killer rebels headed by an evil Commandant. This gripping and intense drama comes to us from director Cary Joji Fukunaga. He's a guy from Oakland, California. 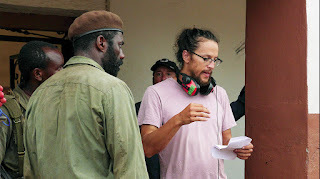 Fukunaga directed Idris Elba to very well-deserved Golden Globe and Screen Actors Guild award nominations in the Best Supporting Actor category. Elba is devastating a corrupt, manipulative man turning little boys into monsters like a Dr. Frankenstein. He himself is a monster who turns his evil on his own kind in that civil war. Idris Elba is one of the film's producers. You will be wowed at the stunning screen debut performance he got out of young Abraham Attah as Agu, the young and mischievous school kid whose life descends into darkness when the government fails his people. Agu's loving father is a teacher. Agu's brother has a photo of Michael Jackson and other black stars on his bedroom wall. Agu has a little sister and loving mother. When they family goes to church, we see images on the wall of a white Jesus. On a wall in the town, a sign read "Co-Operation Builds Our Nation." The town was in a buffer zone, meaning that it was free from the civil war. But rebel forces storm in and wage a brutal, bloody campaign. Villagers flee. Agu's entire family is unable to flee to a safer zone, so the father send the mother and the sister ahead of him and the boys. War shatters his family unit and he sees things no child should. The power-mad Commandant recruits youths to be his new guerrilla army. In order to survive, Agu reluctantly must let Commandant become his new father figure and protector. Soon, the abused child becomes a gun-toting abuser. Cary Funkunaga directed another film about a character who endured a bleak childhood. I still feel that his version of Jane Eyre, starring Mia Wasikowska and Michael Fassbender, should've been an Oscar nominee for Best Picture of 2011. Fukunaga also directed HBO's acclaimed first season of True Detective starring Matthew McConaughey, Woody Harrelson and Michelle Monaghan. 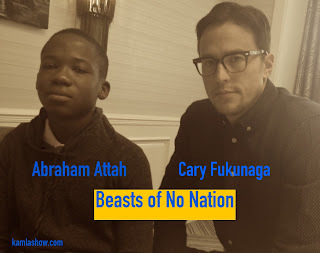 Here's a trailer for Beasts Of No Nation directed and written by Cary Fukunaga. His screenplay is based on a novel of the same name. To see the trailer, click on this link: https://youtu.be/2xb9Ty-1frw. This movie really takes you someplace emotionally. There is shocking violence. A director such as Quentin Tarantino would've had the camera linger voyeuristically on the gruesomeness. Fukunaga doesn't do this. 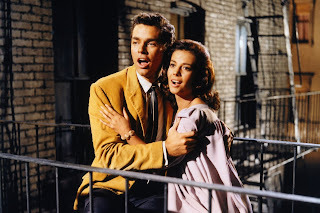 Like William Wyler, he shows us the face of the one committing the act, not the one being brutalized. Think of Bette Davis' face as the wife ruthlessly pumping bullets into her lover in The Letter (1940), the cops pumping several bullets at close range into the fallen, wounded gangster played by Humphrey Bogart in Dead End (1937) and Bette Davis' face as she does nothing to help her husband when he's stricken with a heart attack in The Little Foxes (1940). And there are the remarkable performances from Idris Elba and young Abraham Attah as the kid whose life and soul have been raped by the mechanics of war. Attah is from Ghana. That's where the film was shot. Beasts Of No Nation is streaming on Netflix.